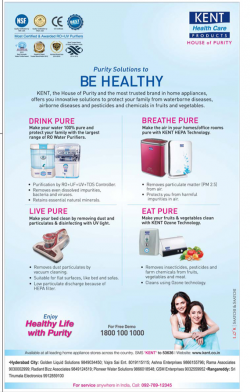 Kent, the House of Purity and the most trusted brand in home appliances, offers you innovative solutions to protect your family from waterborne diseases, airborne diseases and pesticides and chemicals in fruits and vegetables. Make your water 100% pure and protect your family with the largest range of RO Water Purifiers. Removes even dissolved impurities, bacteria and viruses. Make the air in your homes/office rooms pure with Kent Hepa Technology. Removes particulate matter (PM 2.5) from air. Protects you from harmful impurities in air. Make your bed clean by removing dust and particulates & disinfecting with UV Light. Removes dust particulates by vacuum cleaning. Suitable for flat surfaces, like bed and sofas. Low particulate discharge because of HEPA filter. Make your fruits & Vegetables clean with Kent Ozone Technology. Removes insecticides, pesticides and farm chemicals from fruits, vegetables and meat. Available at all leading home appliance stores across the country.